Michel Platini a convert to goal-line technology? Costa Rica's goalkeeper Keylor Navas makes the crucial save from Greece's Fanis Gekas during the penalty shoot-out. Costa Rica win on penalties! 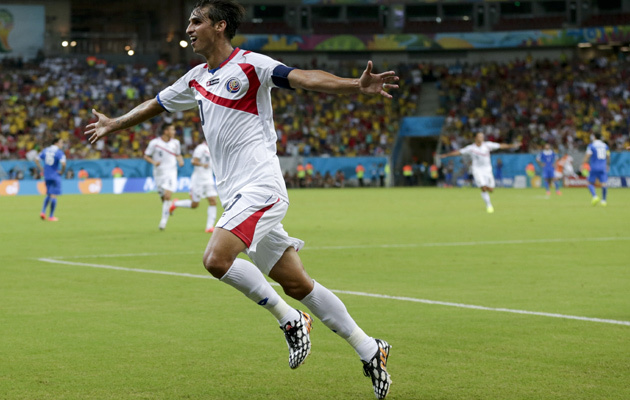 Costa Rica are through to the quarter-finals after winning the shoot-out 5-4. Kostas Mitroglu had a great chance to grab a winner but Navas again gets in the way and Mitroglu scoops the ball side. We’ve got another 30 minutes after that late Greek equaliser. 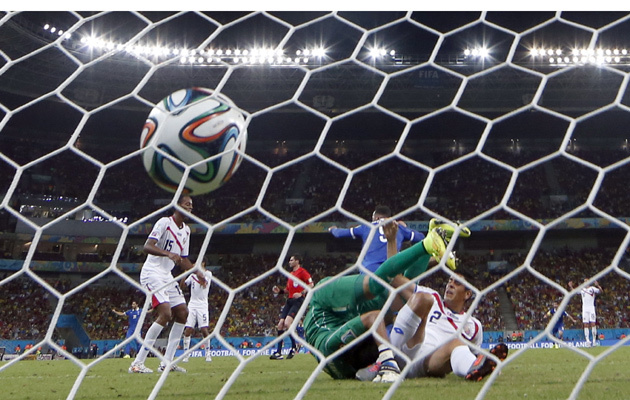 Costa Rica look like they had held on, with keeper Keylor Navas in sparkling form. But the Greek pressure finally paid off. Extraordinary stuff. Even a game that had produced little quality football has managed to produce sensational last-minute drama. Greece have snatched a dramatic late equaliser! Sokratis Papastasthopoulos turns the ball in after Costa Rican keeper Keylor Navas had pushed out a previous Greek effort. Oscar Duarte sent off after collecting a second yellow card. Greece defender Vasilis Torosidis clears a cross with his arm. Lucky to get away with that. Kostas Mitroglu is on for Greece, with Salpingidis going off. Bryan Ruiz hits low shot first time from the edge of the area, Greece keeper Karnezis doesn’t move. A disappointing half. Costa Rica failed to get a shot on target, though Joel Campbell has troubled the Greek defence some with of his approach play and Georgios Karagounis miraculously got away without a booking after taking out Campbell on the edge of the area. Greece had the best (and only real) chance of the half but Dimitrios Salpingidis’ close-range volley was brilliantly saved by Keylor Navas. Costa Rica have had more of the possession but Greece have had the best chance of the half, Keylor Navas saving a close-range effort from Dimitrios Salpingidis with his feet. The cross was from Jose Holebas; it was another brilliant save from Navas. Here’s the team news ahead of this evening’s game in Recife. Greece coach Fernando Santos is sticking with the same line-up that started their final group match against Ivory Coast. Costa Rica have Bryan Ruiz and Joel Campbell in the starting eleven but Ruiz is likely to start midfield, with a five-man defence and Campbell as the lone striker. All over in Fortaleza. 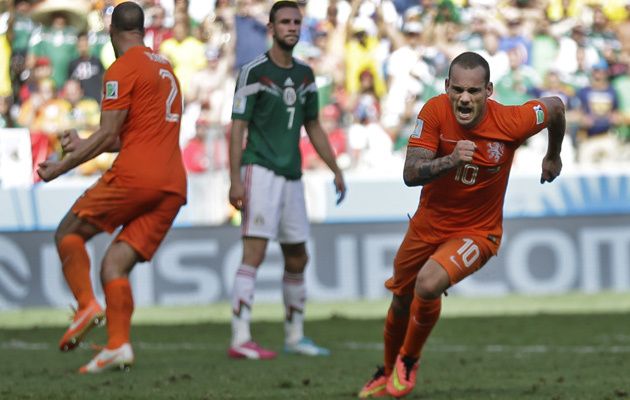 Holland have snatched a dramatic victory over Mexico in the dying second. It was desperately unlucky for Mexico, who looked to be heading into the quarter-finals for the first time outside their own country. But credit to Holland coach Louis Van Gaal for gambling on the substitution of Van Persie with Huntelaar. Holland have won it at the death! Substitute Klaas-Jan Huntelaar puts his spot-kick into the bottom left-hand corner. And Holland have a penalty in the last minute after Robben was tripped by Marquez. Holland have equalised! A scorching volley from Wesley Sneijder with two minutes of normal time remaining. The ball from a corner was cleared to Sneijder on the edge of the area. H smashed the ball past Ochoa, who has finally been beaten. Van Gaal’s gamble of taking off Van Persie and keeping Sneijder on has paid off in spectacular style. A great save from Mexico keeper Guillermo Ochoa to deny Stefan De Vrij from close range from a corner. This is bubbling up nicely. Holland have brought on Memphis Depay for Paul Verhaegh as they seek the equaliser. Mexico have taken the lead at the start of the first half, a long-range shot from Giovani Dos Santos flies past the outstretched Jasper Cliessen. We’re back underway in Fortaleza. Mexico have made a change, replacing Hector Moreno, who was injured while stopping Arjen Robben at the end of the first half, with Diego Reyes. Goalless at the break in Fortaleza. The intense heat has inevitably had an effect on the pace of the game. Mexico have enjoyed more opportunities, with Hector Herrera finding space but shooting wide, and then drawing a cute save from Jasper Cliesson after a run into the area. For Holland, Arjen Robben was almost sent clear in the final minute of the half, with Mexico defender Hector Moreno injured while stopping the Dutch attack. The teamsheets have been published ahead of the 5pm (BST) kick-off in Fortaleza. For Holland Robin Van Persie returns following his suspension for the final group game against Chile. Dirk Kuyt continues at left wing-back as Bruno Martins Indi continues his recovery from injury. The one surprise is Paul Verhaegh starting at right wing-back. Mexico’s Jose Juan Vazquez is suspended after collecting two yellow cards, so Carlos Salcido comes in to play the midfield anchor role. Both teams are expected to play with wing-backs in a 5-3-2 or 3-5-2 formation. The World Cup has passed off relatively peacefully so far, with few of the expected protests materialising. There was a march on the Maracana last night, ahead of Colombia’s victory over Uruguay, but the demonstration was easily contained by a huge police presence on the streets of Rio. Nothing arouses emotions like a World Cup and Brazil 2014 has not been short of moments of high drama. Witness the scenes in Bogota and Montevideo to last night’s match between Colombia and Uruguay. Oscar Tabarez is effusive in his praise of Colombia’s James Rodriquez, who singlehandedly destroyed Uruguay in the Maracana on Saturday. Go on, take another look. It is one of those goals that you will never get tired of seeing. Yes, it’s that goal from James Rodriguez. UEFA president Michel Platini has been a staunch opponent of goal-line technology, preferring instead the additional assistant referees system – as seen in Champions and Europa League matches in recent seasons. 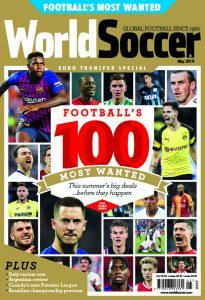 However, according to FIFA chief Sepp Blatter, Platini has undergone a Damascene conversion on the subject and is willing to introduce the system at the next European Championships. Read about this and other proposed changes – including the right for coaches to appeal a referee’s decision during a match – that could be coming football’s way in the next few years. The arrival of the knockout stages is always an anxious moment in a World Cup for both players and spectators alike. For the players, football is now a case of sudden death – the consequences of any mistake magnified. 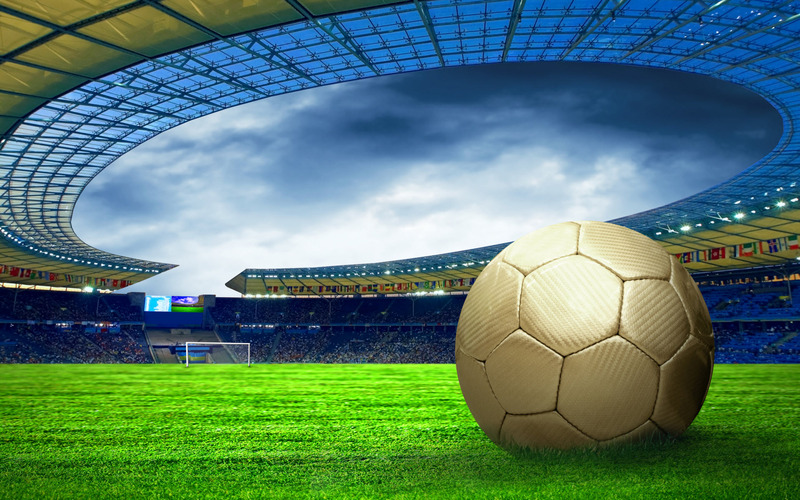 For the spectators, there is always the concern that with the stakes now so high, cautious, negative football will snuff out the early promise of the group stages. Thankfully, judging by the opening matches of the knockout phase, such fears have proved unfounded. Brazil and Chile played out a wonderful match which concluded in a dramatic penalty shootout, while in the day’s other game, we were treated to a moment of breathtaking brilliance from James Rodriguez that will live long in the memory. So, thus far, the omens are good. Today, we have four more sides looking to earn a place in the last 8. Holland play Mexico while the tournament’s surprise package, Costa Rica, face Greece.